3d floor design is one of the most spectacular and exciting modern interior trends. Modern flooring ideas and materials used for self leveling floor are eco friendly, safe and healthy. 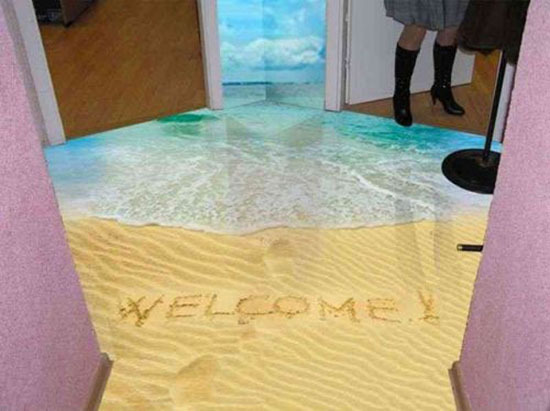 3d floor design allows to create a dramatic change in the room and add beautiful images that improve the mood. 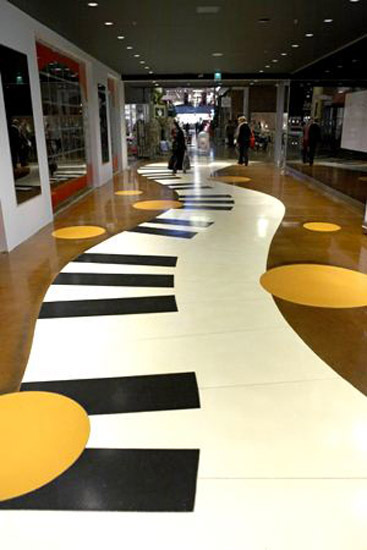 3d floor design ideas are practical and durable. Self leveling floor is able to withstand the weight of heavy furniture and easy to clean and maintenance. 3d floor design looks fabulous, it is functional and very decorative. Self leveling flooring is a good choice for modern interior design in eco style that meets all the requirements of safety. Self leveling floor is a liquid polymer that is applied to the floor surface with an attractive landscape or nature inspired image. After drying it forms a smooth seamless finish. Looking at the floor at certain angles, you can appreciate the exotic 3d prints, adding a whimsical element into modern interior design and decorating. 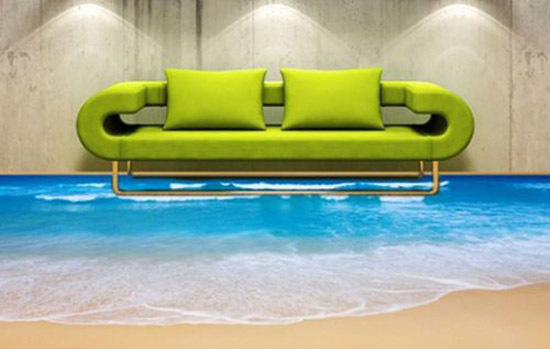 Self leveling floors bring sea waves and golden sand, dolphins and corals or star fish, green lawns and flowing waterfalls, butterflies, plants and flowers, pictures from a satellite, bright patterns and sophisticated designs into modern interior design that look like modern art and make decorating more fun. 3d floor design can be created especially for your interior decorating, creating more harmony with existing furnishings and adding a splash of your favorite color to home decor. Self leveling floor is a versatile option for floor decor, suited for schools, hospitals, offices, industrial buildings, restaurants, boutiques and homes. 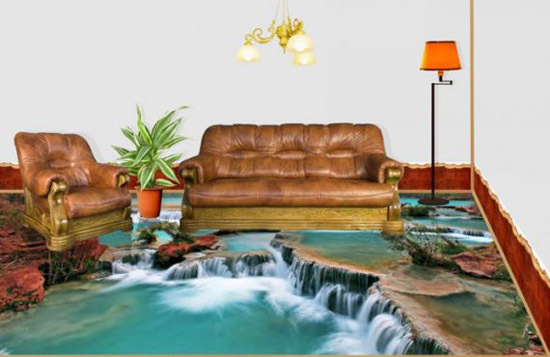 3d floor designs are artworks, offering a simple and elegant way to beautify floor decor. 3d floor designs can be pleasant and relaxing or adventurous and romantic, adding unique decorative accents to modern interior design and changing mood in no time. 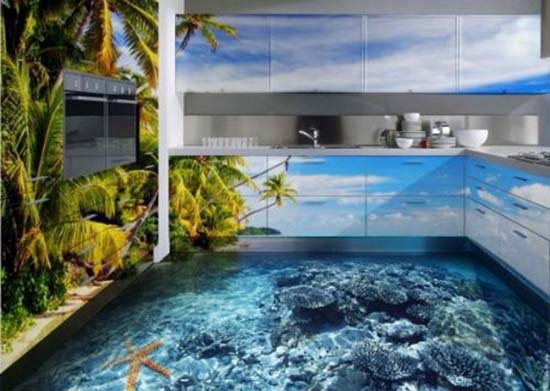 Peaceful and tranquil 3d floor design brings the natural beauty into interior design, turning a room into a paradise. Impressive and exciting 3d floor design adds excitement to modern interior design, creating unique and stunning living rooms, bedrooms, kitchens or bathrooms. The new technology allows using 3d designs for decorating kitchen cabinets and dining furniture, window sills and bar tables. It is easy and simple to create an amazing and gorgeous interior design from the floor to the ceiling. Self leveling floor designs are striking and comfortable, but expensive. The price of 3d floor design is $37 to $50 per sq m or 10 sq ft.
Laminate or tile flooring ideas are much cheaper choices, but the amazing self leveling floor designs that make strong statements are worth the money for creating exclusive, eco friendly, functional and modern interior design.